Silver Bullet Video Slot Guide & Review - Casino Answers! Silver Bullet is a 5-reel, 9-line video slot developed by Playtech featuring a wild symbol, scatter pays and a progressive jackpot side game. 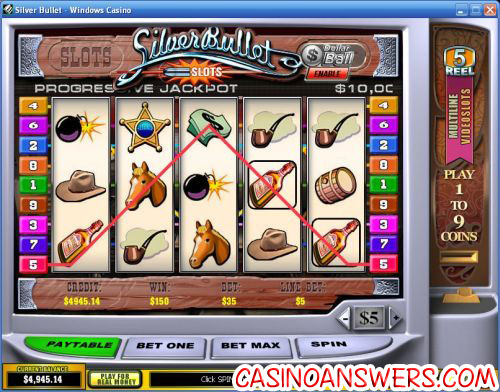 You can play the Silver Bullet video slot at Bet365 Casino and Windows Casino. Silver Bullet is a western-themed video slot. Old-fashioned western music is playing in the background as you spin the reels. Symbols on the Silver Bullet slot machine include: Sheriff’s Badge (wild symbol), Pistol (scatter symbol), Horse, Dollar Bills, Horseshoe, Pipe, Wagon Wheel, Cowboy Hat, Whisky Bottle, 7’s, Bombs and a Barrel. The video slot has a lot of cartoon sound effects that play whenever a reel stops or when you get a winning combination. To play the Silver Bullet slot machine, select a coin value of $0.01, $0.05, $0.10, $0.25, $0.50, $1, $2 and $5. If you wish to play all 9 paylines, all you have to do is hit the “Spin” button to play. If you wish to have fewer paylines active, hit the “Bet One” button to play fewer lines. The largest total bet you can playing Silver Bullet Slots is $45, while the smallest total bet you can make is a penny per spin. Hit the “Spin” button to play the Silver Bullet slot machine or use “Bet Max” to play all 9 lines. To win the 10,000 coin top jackpot on the Silver Bullet video slot, you must have 5 Barrel symbols appear on a selected payline. The wild symbol is the Sheriff’s Badge symbol. It will substitute for all symbols in Silver Bullet except for the Scattered Pistol symbols. The Pistol symbol is the scatter symbol. Two symbols will pay out 1X, three symbols will pay 5X, four symbols pay 10X and if you hit five scatter symbols, you will win 100X your total bet. Enable the Dollar Ball mode to play for the Silver Bullet progressive jackpot. The Dollar Ball lottery costs $1. You get 5 numbers out of 49 to choose from. If all five numbers match, you will win the Silver Bullet Dollar Ball progressive jackpot lottery. You will also receive prizes if you match as few as one number. At the time of this writing, the progressive jackpot is at $10,000. The Dollar Ball feature cannot be activated in free play. Silver Bullet’s autoplay mode is located under “Menu.” You have the option of simply entering the number of spins or you can use the arrows on the left side to expand the autoplay feature into the Advanced Mode. You can set the stop settings of: Jackpot win, single win more than (up to $99,999), overall Win more than (up to $999,999) and overall loss more than (up to $999,999). You can also set the delay between spins to speed up the autoplay. Autoplay can be cancelled at any time by using the “X” button. To get a 100% up to $200 signup bonus to play nearly 200 casino games, including the Silver Bullet video slot, sign up and deposit at Bet365 Casino! Are players from the United States able to play the Silver Bullet slot machine for real money? Unfortunately, American players are unable to play for real money at Playtech online casinos. For another western-themed video slot, you can play the Western Wilderness video slot at Vegas Days Casino. Where can I play a Silver Bullet Flash game for free? To play an Instant Play Flash version of the Silver Bullet slot game for free or real money, visit either Bet365 Casino and Windows Casino. 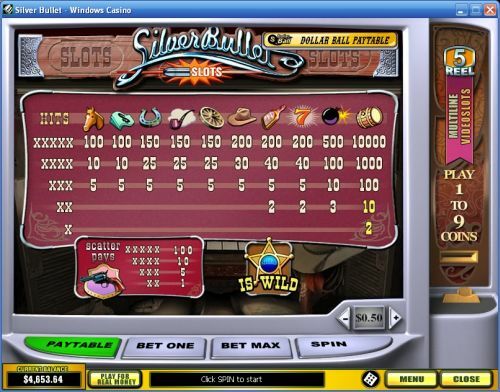 This is the best way for Macintosh and non-Windows players to play the Silver Bullet slot game. How do I win the Silver Bullet progressive jackpot? To win the Dollar Ball Progressive Jackpot on the Silver Bullet video slot, you must play a lottery game where you must predict 5 of the 49 numbers correctly. The Dollar Ball lottery game is a side game that costs $1 per game. For more Dollar Ball Progressive Jackpot slots, please read our Captain’s Treasure Video Slot Review and Football Rules Video Slot Review.